What is Actually the MAC Address? A media access control address (MAC address), also called physical address, is a unique identifier assigned to network interfaces for communications on the physical network segment. MAC addresses are used as a network addressfor most IEEE 802 network technologies, including Ethernet and Wi-Fi. Now, we want to change or mask our unique identity to something else. 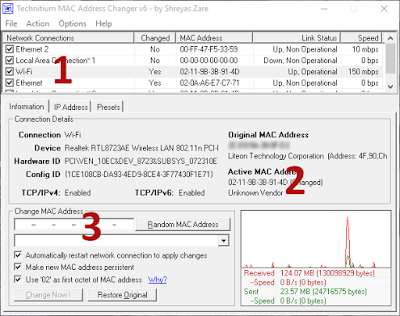 Technitium MAC Address Changer is an incredibly powerful yet easier tool to change MAC. Let us see how to change MAC address with just 3 clicks. Step 3: Select your currently connected network form the list ( Located as 1 in the image). You can easily identify the connection by looking into Link status. choose one with status as “Up, Operational”. Step 4: Identify your mac. You can check whether any other software has masked your MAC. If your original MAC and Active MAC are same, then it is not masked. Step 6: Click on Change Now! You can see a prompt on successful MAC change. If it is not your original MAC Address, Then you’re done.